I stop in for some elk drive-thru. There they are, all males, 20-30, old dudes with lots of points, lounging in a pasture with some geese. I just put in a call to an old friend, someone I deserted years ago in her time of cancer. I will work hard to reclaim a friendship that began in the 1980s. I will have to earn her trust and follow through. Follow through. That’s what it’s all about—in everything. What a place to write, on a bench with elk a hundred feet away. How come I can’t find a real wool or fake wool crew or v-neck sweater in thrift stores? There used to be hundred, thousands. Not a single one in years. (I have one left and it is unraveling as I write this.) All fleece and shiny acrylic pullovers! Fleece totalitarianism! How did this style ever take over (white) men’s outerwear fashion? I don’t want to look like a martinet college football coach on the sidelines or lying at press conferences. I want to look like a writer or old fishermen or scotch sipper! You can’t make art wearing fleece! You can’t tend a burn pile wearing one! In the big city, I will meet a woman I met on a mountain. I’d never met anyone on a mountain before. It’s sort of a thrilling prospect to see where such an initial meeting might go. Reunions are afoot. New work might be materializing. I want to work. My beach installation has reached nine forts. I assisted a woman on the beach who had lost her dog. Mission accomplished, but not then. We didn’t find the dog. She did later, but thanked me in a text for the attempt. Reading two Westerns at the moment. One is by a female author, Jessamyn West. 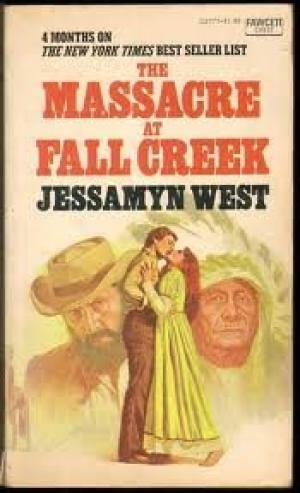 Her Massacre at Fall Creek, published in 1975, is a minor classic in the genre. Relevant today. Funny. Smart. I want to write a modern Western. They still sell! None of the new ones published are ever set in Oregon. Why is that? And you never read about Westerns set at the ocean. I think I’d call my Western Meth Town. I look up from my notebook. An elk is coming toward me. I put the notebook on the bench and wait. Waiting for elk.